Spartan Games is having a sale on their pre-orders for Planetfall over in their webshop for this weekend only. Are you excited for the upcoming Planetfall launch? Planetfall is a fast-paced, action packed game of massed 10mm armoured and infantry conflict set in the Firestorm Galaxy. 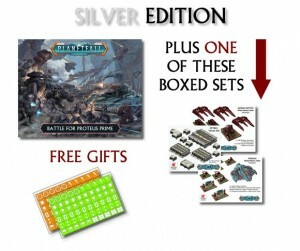 To celebrate this much-anticipated release, we are making three upgrade editions of the Battle for Proteus Prime two player box available for you to buy exclusively from the Spartan Games Online Store, each offering fun extras and incredible value. Don't miss out on your chance to grab one!